I love carrot cake. If you asked me what I wanted for my birthday cake I would say Carrot Cake! So when we found this cute little diner, Babycakes Cafe, recently and they had carrot cake pancakes on the menu I had to give them a try. And then I had to duplicate them. YUMMY!!!!!!!!! So I started with my basic pancake recipe and added lots of carrots and spices. Their cream cheese syrup at the restaurant was really more like a glaze, so I used maple syrup as my liquid ingredient to make an actual syrup and like it even better! The carrot cake pancakes were easy to make and tasted great! And it is always nice to have dessert for breakfast! Sift the flour, baking powder, cinnamon, ginger and nutmeg together in a large bowl. Whisk together the milk, egg, sugar and carrot in another bowl. Mix together the wet and dry ingredients making sure to not over mix them. Heat a griddle and melt some butter on it to coat. Pour 1/3-1/4 cup of the mixture onto the griddle for each pancake and heat until the surface starts to bubble and the bottom is golden brown, about 2-3 minutes. Flip the pancakes and cook the other side until the bottom is golden brown, about 1-2 minutes. Blend together the cream cheese and maple syrup and add powdered sugar to get desired sweetness. 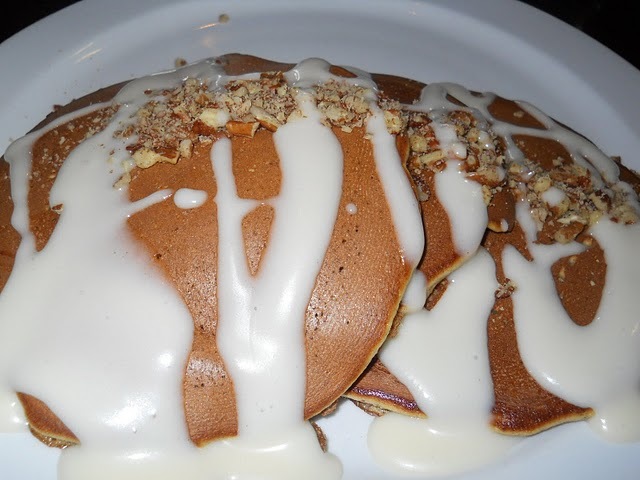 Pour the cream cheese onto the pancakes.